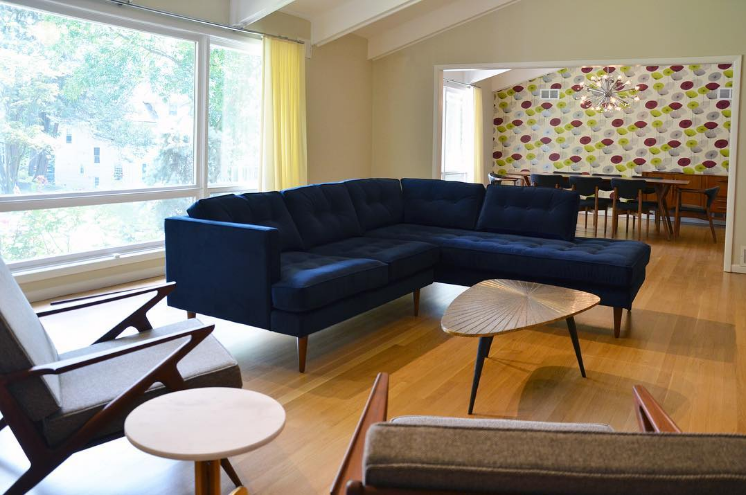 Popular in postwar America, the mid-century modern style has enjoyed a resurgence in interior design. Bold colors, flat roofs, and hairpin legs are just a few elements that epitomize the clean and bright feel of these homes. 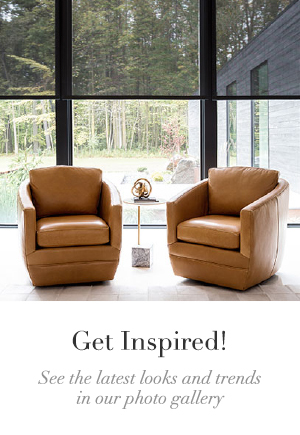 If you live in a building built during this period from the 1940s to the 1970s, or if you just want to bring a little mid-century flair to your current abode, read on for our top tips and picks. One of the hallmarks of mid-century modern homes is an emphasis on nature and the outdoors. This often manifests in large windows, sliding glass doors, patios, and other indoor-outdoor living spaces. Drapes make an excellent window treatment on these spans of windows, as they can be swept aside during the day to maintain the views of nature and closed at night for privacy. In the photo above, interior designer Julie China keeps the drapes neutral and brings in pops of color with the sofa and wallpaper. The window and open floor plan between the dining room and living room are classic features in this mid-century ranch home. Contrasting with the views of nature and organic textures is mid-century modern’s reliance on straight, clean lines throughout the home’s interior. 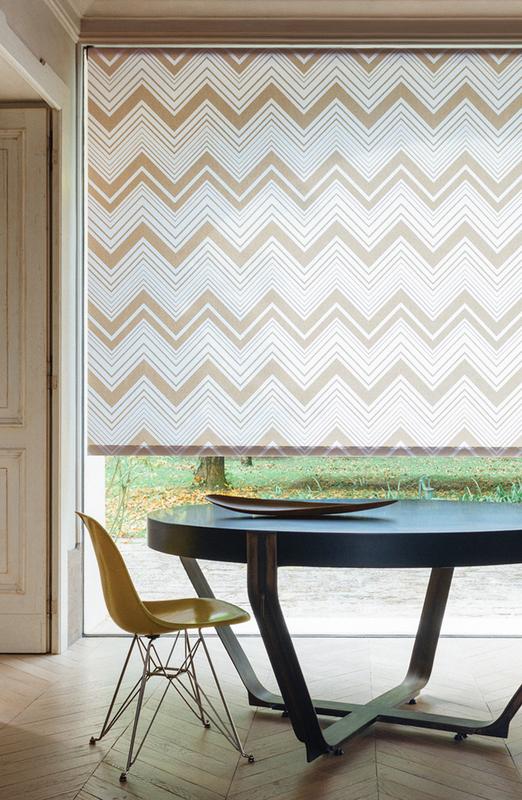 Roller Shades are a perfect fit for this style, with their sleek, minimal design and almost invisible stack when raised. Roller Shades can be used to cover glass doors and wide windows, with a variety of light filtering and blackout options depending on your home’s needs. A Roller Shade in an eye-catching chevron print, as shown above, pairs beautifully with the Eames-style chair and industrial table. We can’t bring up the 1960s and 1970s without mentioning prints. 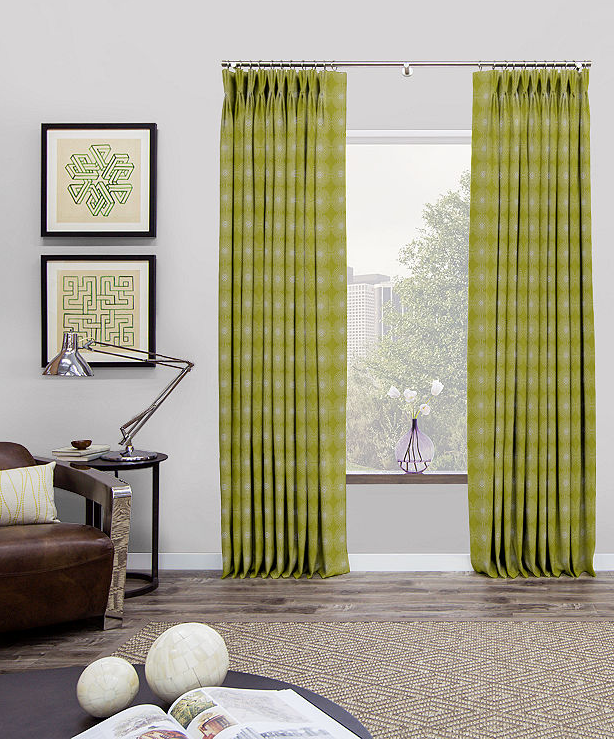 For an instant dash of mid-century, try Pinch Pleat Drapes in a geometric pattern with saturated colors like spring green, mustard yellow, teal, and orange. Many of our designer collections feature bold prints with geometric lines, such as Jonathan Adler (pictured below is his Super Nova fabric), The Novogratz, and DwellStudio. 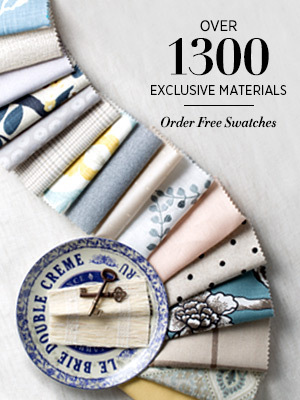 If you choose a bright and busy material for your drapes or shades, the wall color and furniture colors can be slightly more muted and highlight natural earth tones. 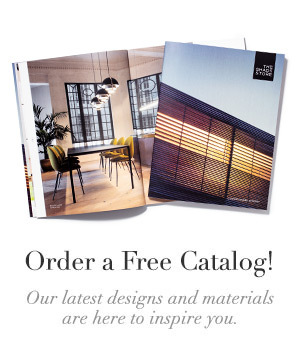 Browse our photo galleries for more inspiration, or stop into a showroom near you and talk to one of our expert Design Consultants. We’d love to help you complete your mid-century modern look with period-appropriate window treatments.